How healthy is soy for human consumption? While some consider it a super food, others claim that soy in the diet is poison that causes hormonal imbalance. As in most cases when it comes to diet, on both sides there are strong arguments. This legume is originally from East Asia. It is used for the production of tofu, soy milk and other substitutes for dairy products and meat, as well as for the production of fermented foods such as miso, tempeh which is the most consumed food in Asian countries. Genetically modified soy is especially present on the American continent and is hazardous to human health. Fundamental researches were carried away to examine the impact of the consumption of these legumes on blood cholesterol levels. Results published in some studies have shown that soy protein can really affect the lowering of total and LDL cholesterol, while there is a number of other claims that it is without any influence. It important to note: even if soy reduces cholesterol in the blood (with what researchers generally does not agree) - there is no solid evidence that it reduces the risk of heart disease, although several studies claims the opposite. Also, some studies have shown that soy in the diet can reduce the risk of prostate cancer, the most common form of cancer in men older than 50 years. What we now know is that more than 90 percent of the crop legumes produced in the United States are genetically modified - the so-called GMO soybeans. They are sprayed with herbicide called Roundup, which is associated with numerous adverse effects on human health. Soy in human nutrition is mostly used for the production of soybean oil, which is obtained by extraction with the use of chemical solvents like hexane. With the extraction of fat from soybean products we get soybean meal, which is used for animal feed, and with further processing we obtained isolated soy protein. Because they are cheap and have certain functional characteristics, soybean oil and soy protein are a part of almost all foods, so many consume it into the body in large amounts, and they are not aware of it. In the composition of soy there are numerous important nutrients: manganese, selenium, copper, potassium, phosphorus, magnesium, iron, calcium, vitamin B6, folic acid, riboflavin (B2), thiamine (Bi), and vitamin K. Soy calories portion of 100 grams of cooked mature soybeans contain 173 calories, 9 grams fat, 10 grams carbohydrates, 6 grams of fibre and 17 grams of protein. In addition to the abundance of helpful nutrients, soy in the diet is very useful because it contains a large amount of phytates, substances that bind minerals and prevent their absorption. This legume is a pretty good source of protein, however, in processing at high temperatures - their natural properties are changing, and the quality is significantly impaired. Most of fatty acid composition of soy is made up from omega-6 polyunsaturated fats, which in large quantities can cause inflammation in the body and cause numerous health problems. The fact is that most of the inhabitants of Asia consume soy with no apparent adverse effects on health, but on their tables can be seen exclusively fermented soy products (miso and tempeh). Fermentation in soybeans break down some of the phytic acid, or a certain amount of isoflavones in these products still remain. It should be noted that soy in the diet of Asian people is not used as a main meal, but mainly as a seasoning so they do not consume large quantities of it. For this it is particularly considered a healthy food product because it contains large amounts of vitamin K2, which is important for cardiovascular health and bones. Numerous portals of alternative medicine often debate how much soy is healthy and whether it can affect the growth of breasts. Opinions are of course divided, it can be read that girls who passed on a pure vegetarian diet got bigger breasts, while others argue that it is not possible and that is not true. What is definitely known is that soy contains large amounts of biologically active isoflavones, which cause disorders of the endocrine system. They function as phytoestrogens, plant compounds that affect the estrogen receptors in the human body (influence on the growth of the breast). Key isoflavones in soy are genistein, daidzein and glycitein, identified as endocrine disturbers, chemicals that interfere with the normal functioning of hormones in the body, activate or inhibit estrogen receptors. It was found that isoflavones can alleviate the symptoms that accompany menopause and reduce the risk of bone loss in middle-aged women when used as a substitute for estrogen therapy. However, such use causes controversy to experts, most of whom consider that the risks outweigh any potential benefits - and this is especially true for natural breast augmentation. In doing so, take into account a number of tests whose results show that soy in the diet can cause breast cancer, regardless of what many experts say that women who eat soy, in fact, are less at risk of developing this type of cancer. In fact, one study included 48 women, divided into two groups. The first group ate in conventional way, while the diet of the other participants of the experiment was supplemented with 60 grams of soy protein. After only 14 days, the breast in women who consumed soya proteins measured substantial increase in the number of epithelial cells, indicating the tendency that they are converted in the cancerous tissue. In addition, the results of some less extensive studies have shown that soy in the diet of women causes mild menstrual disorders - postponed menstruation or its extended duration. There are doubts that an increase in estrogen-induced soy isoflavones may in some way affect the quality of sperm and testosterone levels in men, although the results of researches in this regard are quite diverse. Soy isoflavones also can act as goitrogems, substances that interfere with the activity of the thyroid gland and prevent the functioning of the enzymes of thyroid peroxidase, necessary for the production of thyroid hormones. This was proven by the quarterly survey in Japan, which included 37 adults. It was found that consuming 30 grams of soy beans a day for three months - causes an increase in the levels of thyroid stimulating hormone - TSH levels, which is a sure sign of impaired function of the thyroid gland. Many study participants felt the symptoms of hypothyroidism, such as fatigue, constipation, sleepiness and increase thyroid, who withdrew after the soy was removed from the diet. However, there are also studies whose results suggest that soy does not affect the functioning of the thyroid gland in the human body, or whether the effect are very mild. Simply put soy in the diet of people for years in the scientific community causes controversy and different opinions. Considering the results of research on the impact of these grains on human health in many ways creates confusion. For each study that proves harmful effects of soy comes at least one which points out that the soy in the diet is more than desirable and draws out the benefits. Analysing numerous sources, the experts made the conclusion that the studies that highlight the usefulness of soy are sponsored by industry for the production and processing of soybeans. It does not necessarily mean that the results of these studies are not valid, but keep this fact in mind. 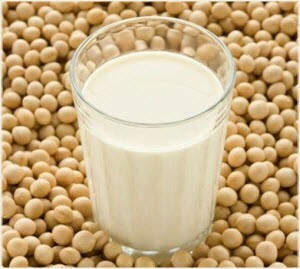 There is no reliable evidence that moderate amounts of soy can to a greater extent, endanger the health of an adult man, but for pregnant women, nursing mothers and women planning pregnancy it is recommended to avoid soy and other substances that affect the operation of the endocrine system, and for food based on these foods - it is certainly safer to opt for milk and milk products. All other lovers of soy are advised to consume only fermented products such as for example, soy milk, and only in small quantities. There is no reliable evidence that the soy in the diet of children is harmful to health. According to one study, female infants who are fed soy based products - at the age of two years had a much larger mammary gland tissue than those whose diet based on milk and dairy products. Other studies show that girls whose diet is based on soybean are more likely to enter puberty earlier. Studies in the USA have confirmed that in girls very early pubic hair appeared, and that they had swollen breasts. There is also evidence that a diet based on soybean in girls may later cause an extension of the menstrual cycle and painful menses. In addition, baby food based on soy contains large amounts of aluminium and manganese - significantly higher than breast milk - which can cause neurological problems and cause hyperactivity and attention deficit disorder. A general recommendation is that to avoid the soy in the diet of children to limit the aforementioned health problems.